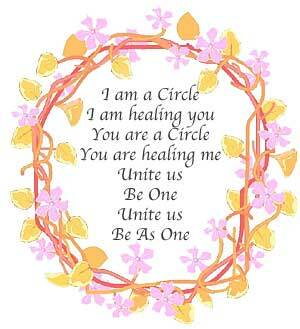 In the Circle we meditate together , then share our life's journey, what we are learning, what we are healing, who we are becoming, connecting with our inner Selves, while the circle of women holds a sacred space with unconditional love for each one of us to be. It is always a special opportunity and blessing to hear oneself and each other speak authentically from the soul and heart. Because of woman's cyclical nature she is practically and spiritually attuned to the spiritual teachings of the circle and council. The whole universe is composed of natural cycles, supporting and intertwining with each other in infinite wisdom. We are inviting each woman back to take her place into the heart of the spiritual circle of women, weaving a web of healing, love and support. Women have not always felt safe to feel, speak and act from their own values. Women's voices have not been heard and respected. They have unique feeling values which are needed for themselves and the planet. In this circle we want to fully support, acknowledge and encourage ourselves and each other as women to discover, feel and express who we really are. Women have the capacity of unconditional love for their children and partners. In this circle we will give and receive the same deep sensitive unconditional love to ourselves and each other as women. Collectively we start the circle with a meditation, while holding hands. We do this to connect with each other's inner spiritual Consciousness, as souls, women and sisters. 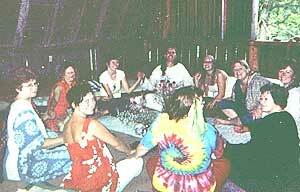 We create a sacred space, bringing into our circle the spiritual energy and mystery of the Divine. After the collective meditation we have a sharing circle where each woman takes the bowl and speaks her truth. The women in the circle hold sacred space for her; as Nell Merton called it: "Hearing her into real speech" from her own inner Self. She decides when she is finished. It is her time. There is no interrupting, commenting or giving advice ( Internally or externally). The purpose of the circle is that each woman gets in touch with her feelings, hears her Self speak and is witnessed by the sacred circle. You are speaking for your Self, daring to step into a place where you haven't been before. Each word you speak and each silence belongs to you and is filled with your being and presence. In this way as a woman you heal, take back and own the energy locked up in these feelings as a strength. A shift of consciousness happens, a feminine part of us is embraced spiritually by the Divine within.